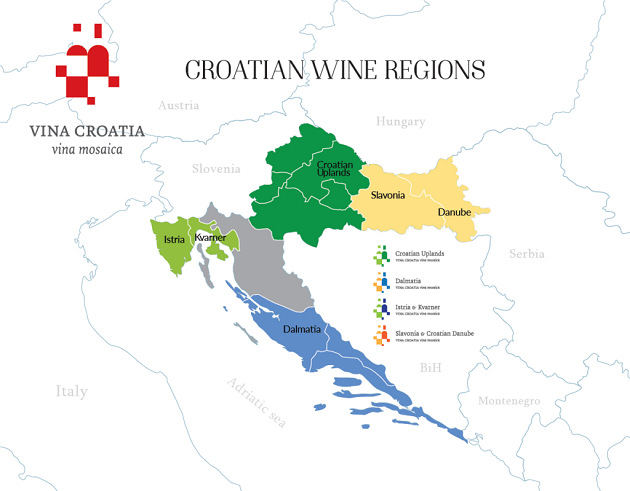 The Republic of Croatia, located in Eastern Europe is one of the oldest wine growing countries in the world, and yet is relatively unknown to the average Canadian like me. The region possesses both mediterranean and continental climates and a soil structure that travels the spectrum, from sandy to volcanic. The result is a terroir that is proficient at yielding a myriad of varietals – everything from global mainstays such as Cabernet Sauvignon, Chardonnay and Merlot to indigenous grapes such as Graševina, Pošip and Plavac Mali. During the Cold War, as part of The Socialist Federal Republic of Yugoslavia, Croatian wine production was based on large cooperatives and the focus was on volume over quality. 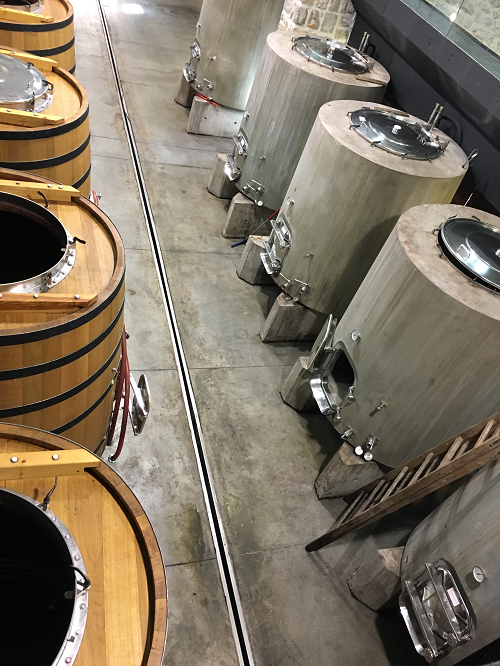 Since the fall of the iron curtain in the early 1990’s however, the focus has now very much changed and winemakers are once again able to express themselves through their craft. Upon landing in Zagreb it occured to me that I knew very little about Croatian wine. Throughout my ten day stay in this beautiful country in November after harvest, I would gain a fruitful education and appreciation of the people, culture and wines contained within. 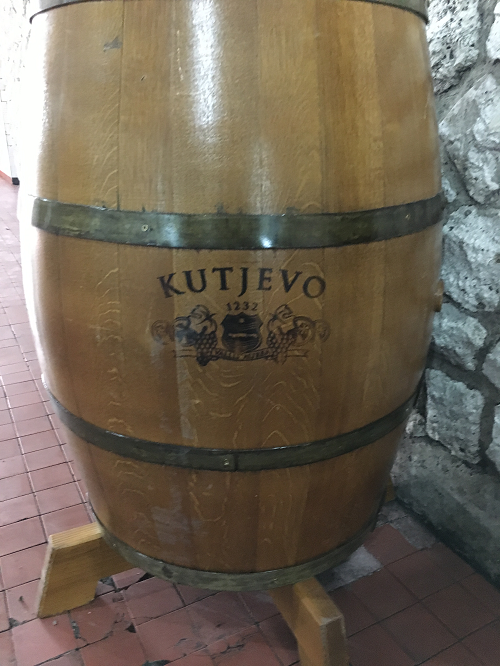 The first destination on my tour was Kutjevo Winery. 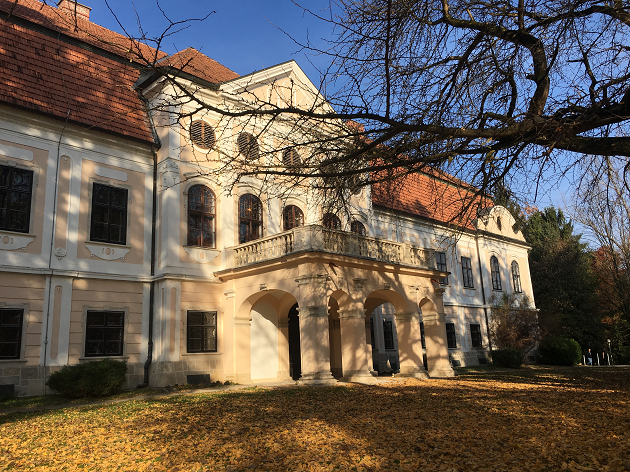 Located in the historic Slavonia region at the eastern end of the country it has been a symbol of Croatian wine culture since 1232. This is one of the largest wineries and one of the biggest exporters of wine in the country. Their vineyards are primarily made up of Graševina (Grash-a-vee-nah) grapes and span over 43 kilometres. The volcanic terroir of this region lends itself to producing a unique expression of the Graševina varietal. It is highly regarded as one of the best in the country. The winery uses Slavonian oak barrels which are grown in the nearby forests. After a lengthy tour of the vineyards by the chief oenologist, Zdravko Raguž, we retired to the upper levels of an ancient watchtower for lunch, which offered a stunning view of the surrounding farmland. 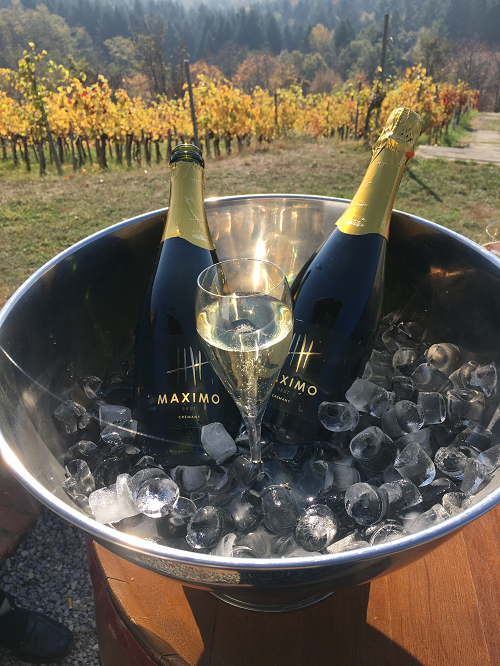 The dry, youthful Maximo Brut 2016 sparkling Graševina, done in the traditional method, was a perfect refreshment after our hike. We were also treated to some traditional foods from the area. 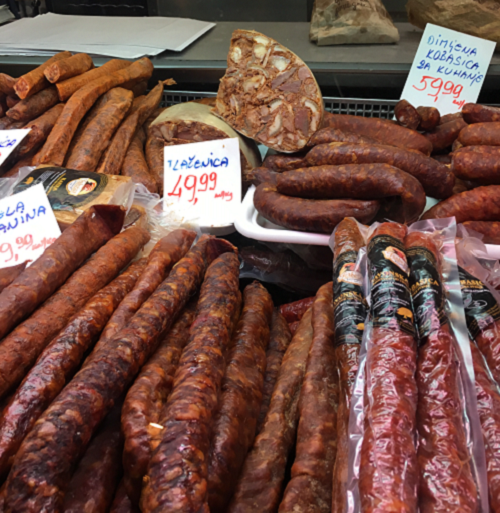 Kulen, a dry-cured sausage and Čvarci, fried morsels of pork fat. 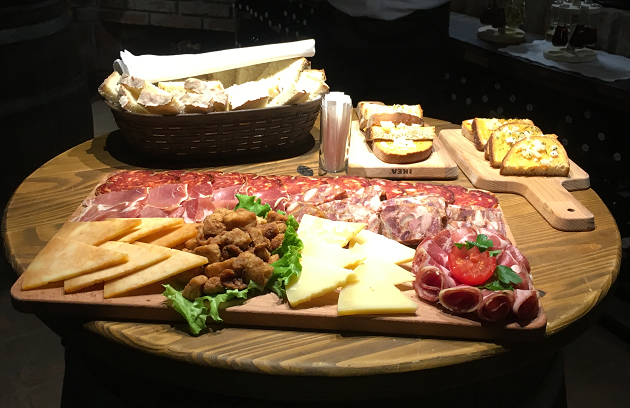 A selection of cheese and meat including Kulen, and Čvarci. Graševina, also known as Welschriesling is grown over many areas of central and eastern Europe. Although it bears a similar name to Germany’s favourite cool climate varietal, it has its very own unique flavour and no resemblance to Riesling. 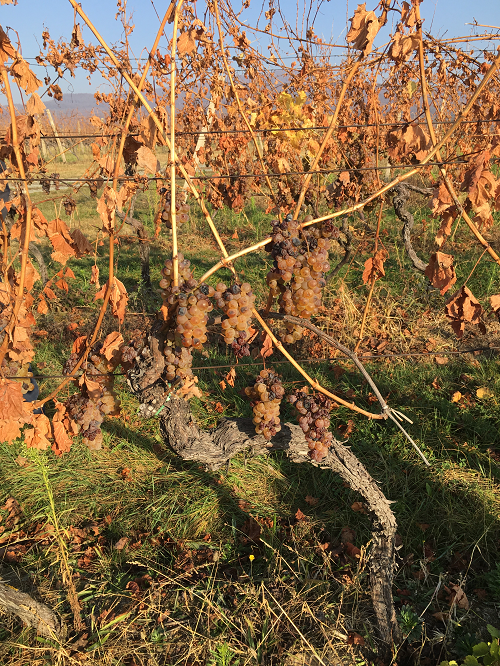 The origin of the grape isn’t fully understood but it has a deep rooted history in continental Croatia. It is now considered domestic to the Slavonia region. Graševina is the most planted white wine grape in the country. Whether dry, sweet or sparkling, wines made from this grape share a consistent profile with aromas of golden apples, flowers and profound minerality. 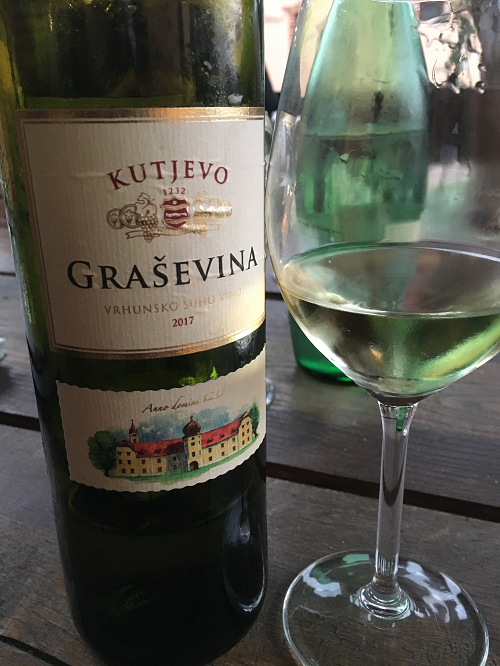 As the day lengthened we retired to the tasting room to sample the most significant example of the winery’s Graševina production: the 2017 vintage of Kutjevo Premium Graševina. It is a floral, dry white wine with aromas of quince, pear and a trace of crushed stone. 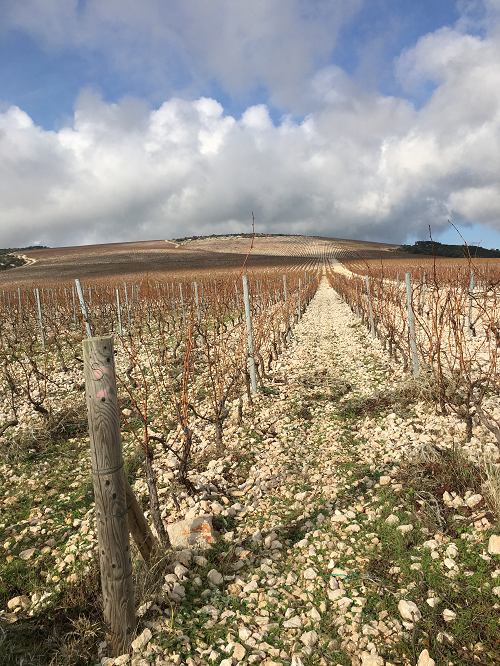 When one hears the word Chablis one naturally thinks of Northern Burgundy and likewise when one hears the word Graševina, Slavonia should instantly spring to mind. This wine is currently available through the LCBO from a recent release. After spending a couple nights in Kutjevo my companions and I headed off towards the capital city of Zagreb. Along the way we stopped at Daruvar Winery in, you guessed it, Daruvar. It is a small winery owned and managed by Badel 1862 the largest and oldest producer of wines and spirits in Croatia. 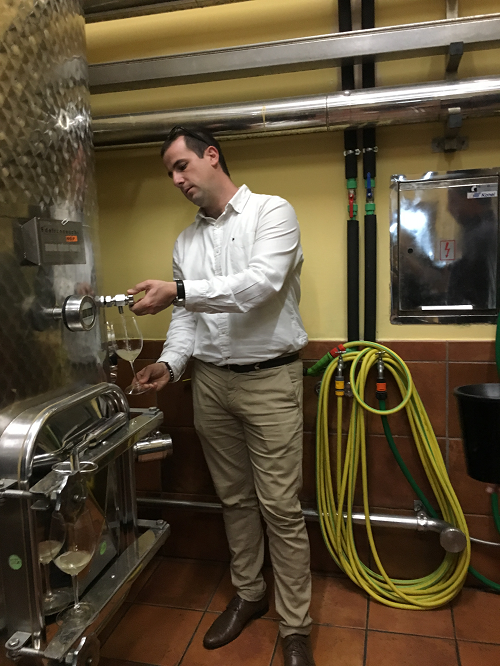 We had a quick tour of the vineyard and tasted a selection of wines comprised of Graševina, Sauvignon Blanc, and Chardonnay. 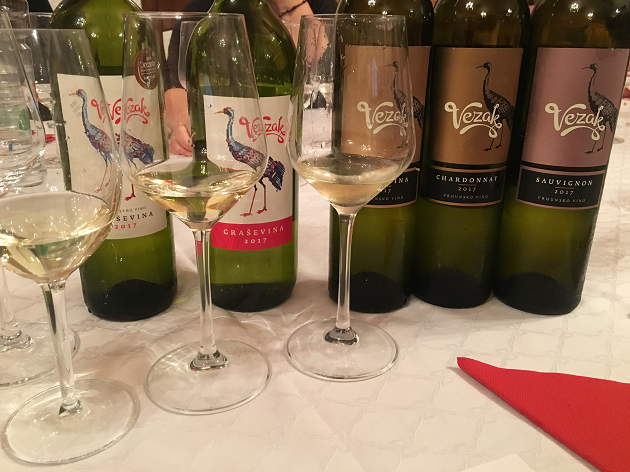 Daruvar Vezak Sauvignon 2017 reinforced these accolades. The image of the crane used on many of the labels is a symbol of the town of Daruvar and comes from the Hungarian word “daru” which means crane. The capital city of Zagreb is truly a mixture of old and new world edifices, with juxtapositions of contemporary and ancient sites around every corner. It is the seat of political and economic power in the country and is truly a European tourist mecca. The architecture is vibrant and varied, with influences from ancient historic cultures and more contemporary endeavours. We checked into Hotel Academia, a modern, centrally located hotel which was a perfect location from which to take a tour of the city. We began in Dolac market, a bustling farmer’s market featuring everything from fruit and vegetables to cheese and fresh butchery. 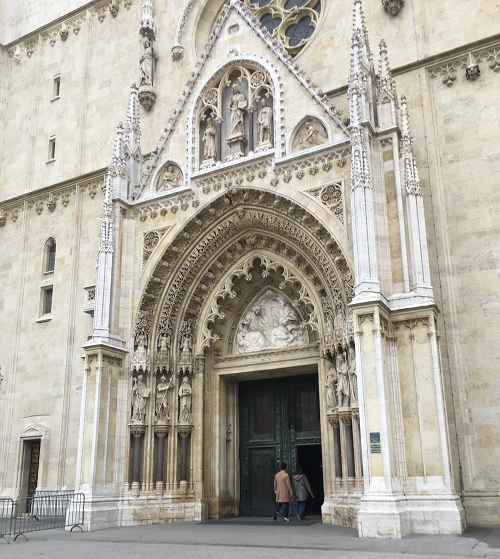 Next we visited Zagreb Cathedral, a huge Gothic styled Roman-Catholic, twin-spired structure originally completed in 1217 and St. Mark’s Church, another 13th century edifice known for its colourfully tiled roof. We walked the Strossmayer Promenade, built atop an ancient defensive wall which offered a stunning panoramic view of the city. 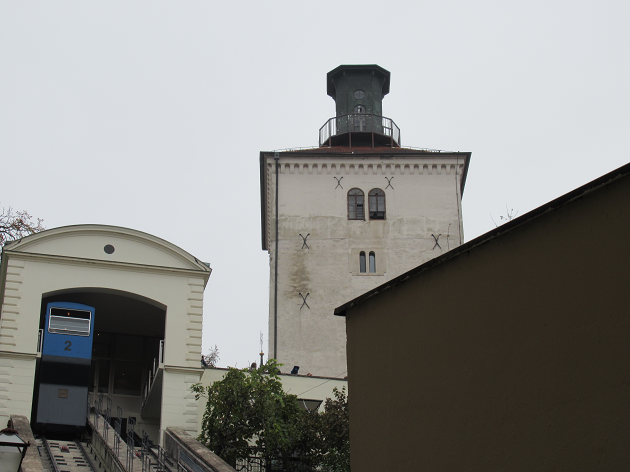 Lastly we boarded the funicular trolley and ascended to Lotrščak Tower just in time to witness the noon-time firing of Grič cannon. 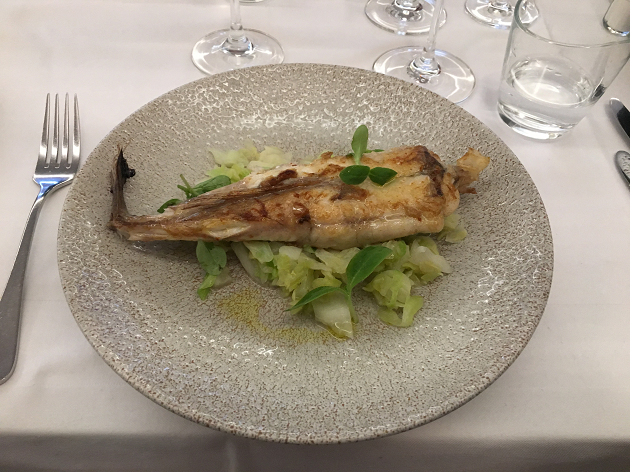 After the extensive tour of some of Zagreb’s notable historic sites, we attended a fabulous wine pairing lunch at the renowned Apetit City Restaurant, owned by Sanja Cabalier. The knowledgeable staff proficiently paired wines for us with our midday meal. 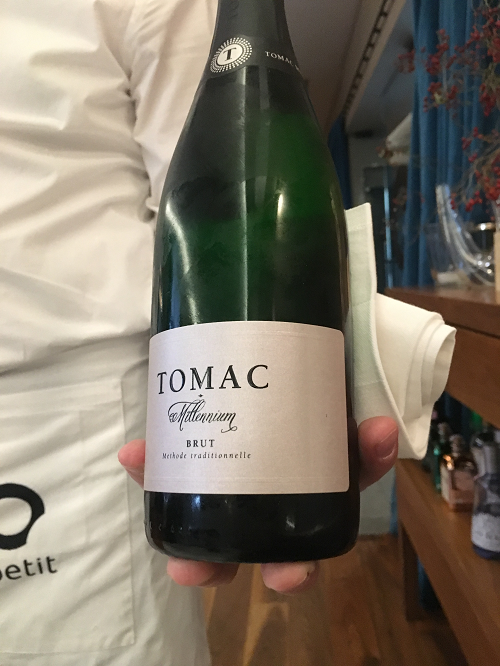 The tasting began with Tomac Millennium Brut, a sparkling white wine from Tomac winery in Pleševica. This wine region is about 40km southwest of Zagreb and some top quality sparkling wines come from this area. Done in the traditional method, it is composed of 70% Plavac Žuti and 30% Chardonnay. It was dry, crisp, and had elements of white grapefruit, wet stone and toasted baguette. 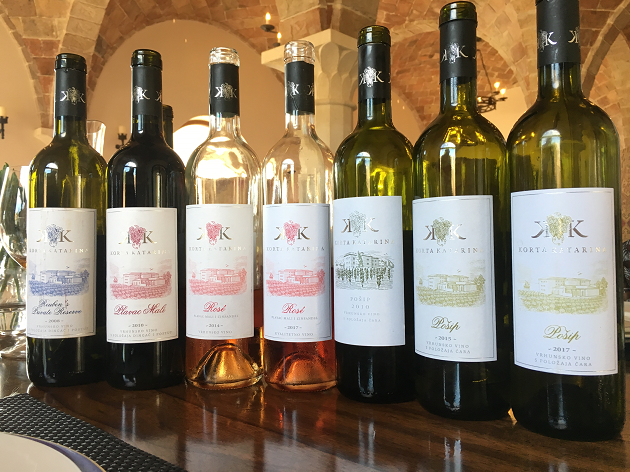 Next was the Pošip 2017 (Po-ship) from Nerica Winery on Korčula Island in Dalmatia. The Island of Korčula is the birthplace of the Pošip grape variety. Stone-fruit, yellow flowers and iron-like minerality. 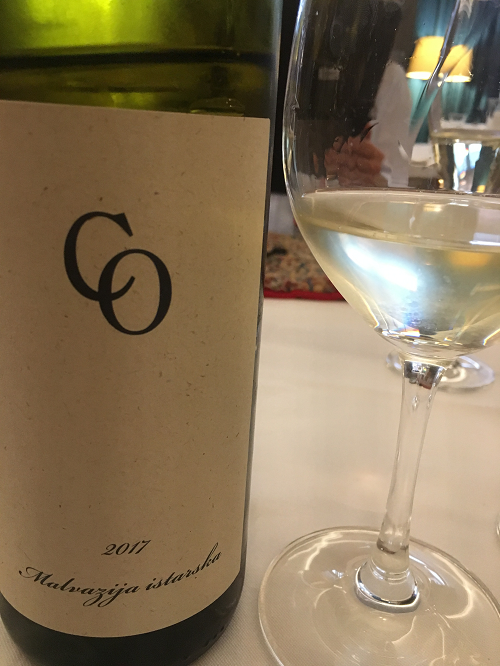 The third wine of note was the Coronica Malvazija Istarska 2017 from Istria. Made up of 100% Istrian Malvasia grapes. Even though I wasn’t able to visit Istria during my time in Croatia I felt as if I had travelled there through the tasting of this wine. It showed pleasant characteristics of pomelo, apricots and minerality. It paired perfectly with the meal. 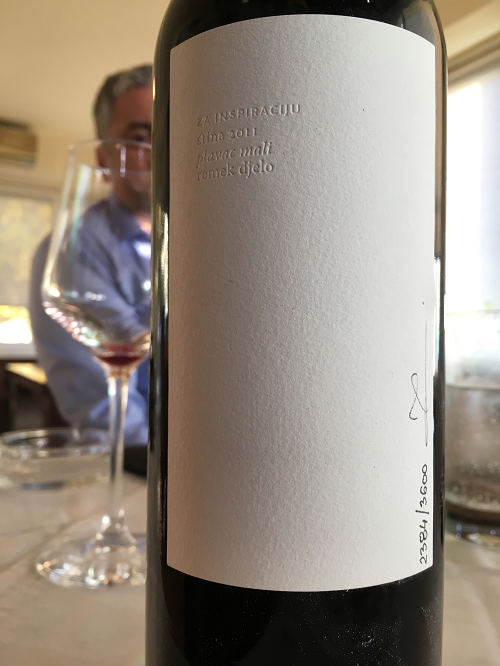 After lunch we headed to a tasting hosted by The Croatian Wineries Association and had a chance to further sample some interesting local wines, a notable standout being Zlatan Otok Plavac Grand Cru 2011. From restaurants and café’s to ancient fortifications and old world charm, Zagreb was truly an unforgettable destination. 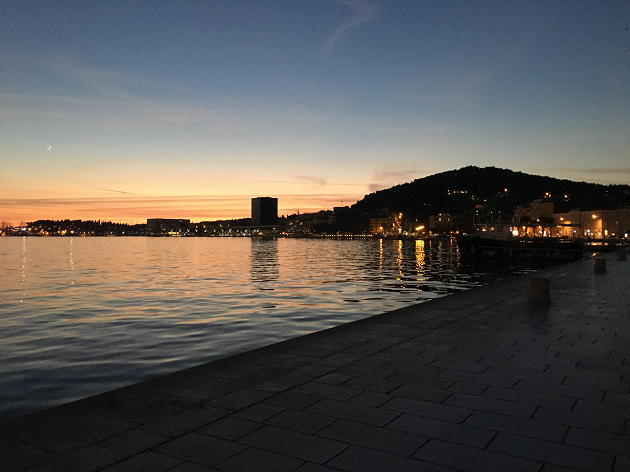 For the next leg of my trip we headed south by car to the port town of Split. We would officially be leaving behind the continental climate of Central Croatia and entering the Mediterranean. There we would catch a ferry to the isle of Brać to visit Stina, a young boutique winery making waves internationally. We arrived in the evening and met Stina’s representative, Emil Mehdin at our hotel for a meal and a sampling of the Plavac Mali Majstor 2015. Plavac Mali (Plah-vats-mah-lee) is the primary red grape grown in southern Dalmatia. Plavac Mali was originally thought to be an ancestor of Zinfandel. 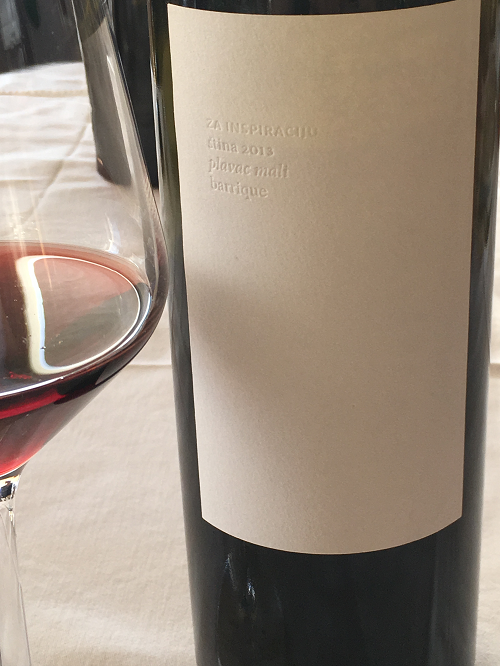 After DNA analysis it became apparent that Zinfandel was actually one of its parents alongside Dobričić an ancient Croatian varietal from the island of Šolta. This hardy grape, often planted in a bush vine style produces wines with robust flavours and tannins. It is Croatia’s flagship, rockstar grape. Stina means “stone” in the Dalmatian dialect. It is named after the white limestone that Brać is famous for. As we travelled south across the island we saw evidence of it everywhere. 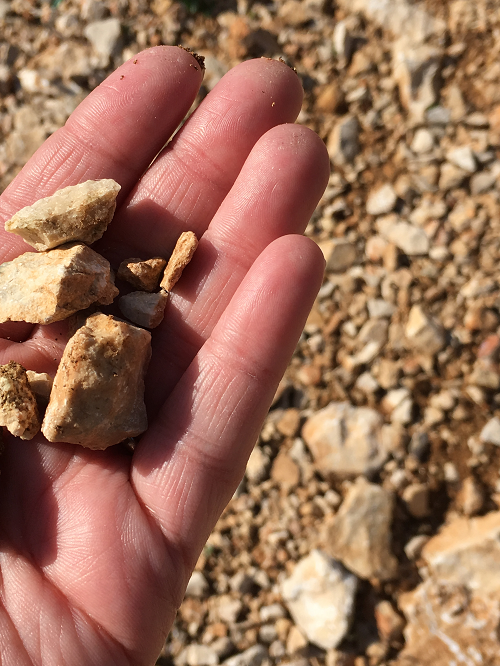 The stones are a large part of the terroir – Mmmm minerality! 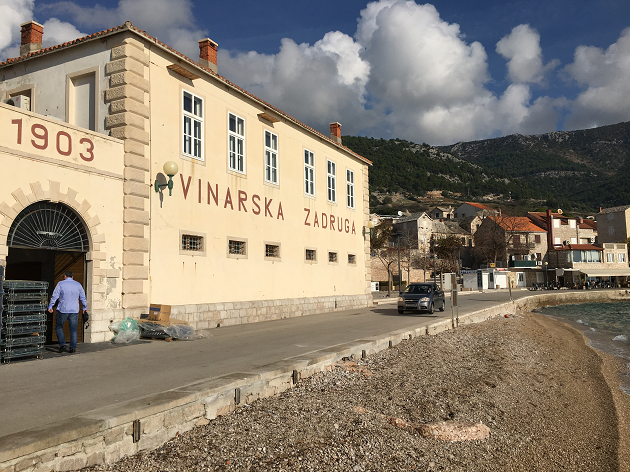 We arrived at the winery and were greeted with some sparkling Pošip and given the chance to take in the atmosphere of the ocean-front edifice. The winery building itself was built in 1903 in the Austro-Hungarian style. It was the site of “The First Dalmatian Wine Cooperative” as is still inscribed in the front of the building. Now renovated in a modern yet elegant style, the original walls and ceilings can still be seen amongst the cutting edge machinery. Built right on the shore of the Adriatic Sea, the view from the winery building was breathtaking and memorable. 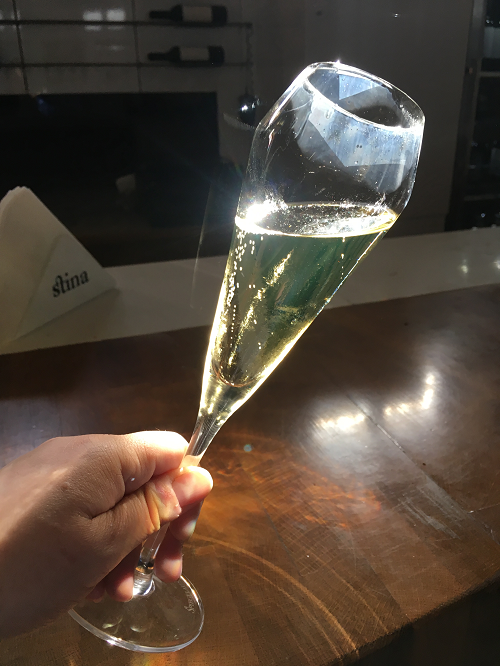 Emil explained that when you drink a Stina wine it’s not just a libation it’s an experience. It’s about creativity and making an emotional connection. You become one with the terroir, the harvest and the sunlight. He further carried this idea forward in describing the concept behind Stina’s unique labels. Brać is an island of artists and poets, the label on a bottle of Stina wine is a blank canvas. 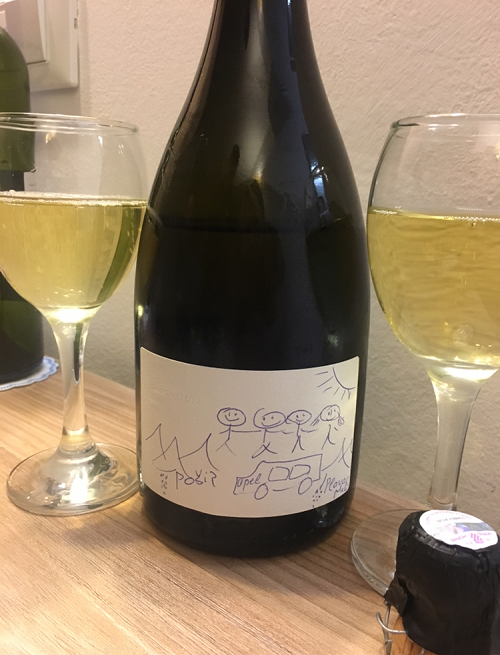 Imbibers are encouraged to create their own artwork on the bottles as an expression of their experience. We were given a tour of two of Stina’s vineyards. The first although planted in a level field, was not a simple endeavour due to them having to clear away and sunder tonnes of stone. A common necessity amongst Dalmatian wine growers. The main planting here was Pošip. Stina’s Posip Vineyard. White stones everywhere! 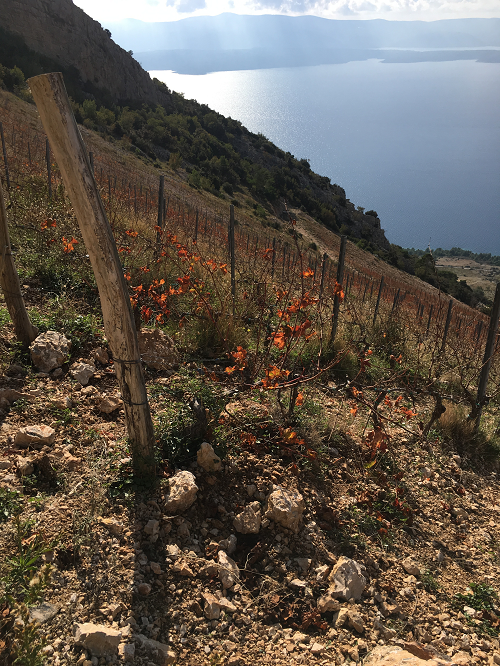 The second vineyard we saw was planted at extreme elevation overlooking the Adriatic Sea. The route getting there was precarious to say the least but our driver navigated the switchback trails as if he was born doing so. The vines themselves were planted amongst stone-walled terraces and plummeting hills. Harvesting here can only be done by the sure-footed. 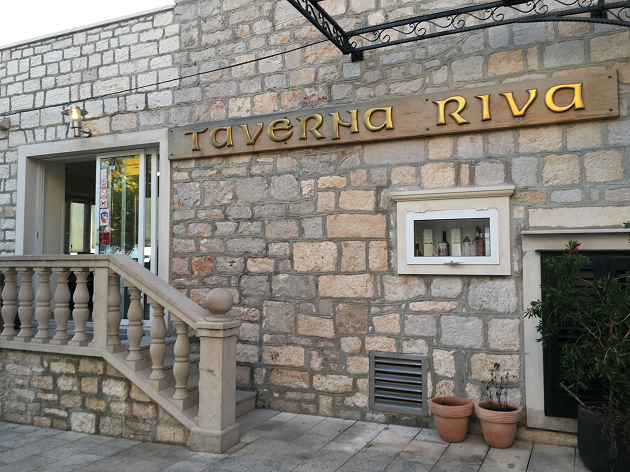 After our harrowing tour we returned to the winery for a proper tasting followed up by a lovely private dinner and pairing at Taverna Riva. Stina Plavac Mali Remek Djelo 2011 overlooking the sea! 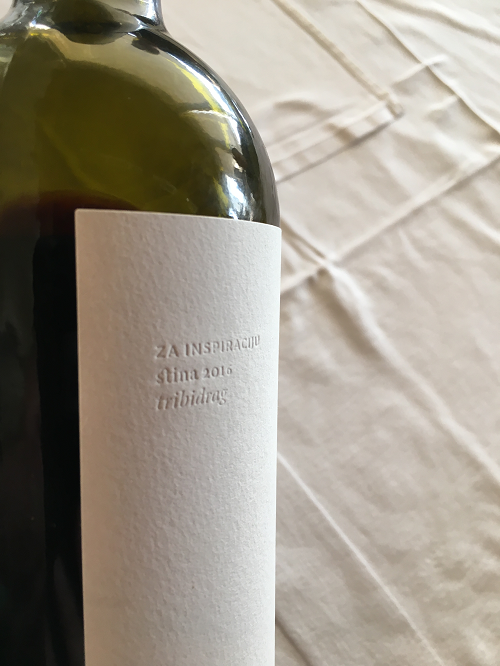 Recently it was discovered that Zinfandel and Primitivo originated in Croatia and has been existing for centuries under the name Tribidrag! Like its American and Italian cousins it has all the characteristics you would expect from the lineage while remaining uniquely Croatian. Oddly enough it wasn’t until the connection with Zinfandel was made that Tribidrag production would begin in earnest. The Stina Tribidrag 2016 was a pleasure to taste, offering recognizable fruity jam infused flavours with fresh herbal and mineral components. It was both familiar and fascinating. The next destination of our journey, was Korta Katarina Winery and Villa. Another beautiful seaside destination, located on the Pelješac Peninsula, in the township of Orebić. A palatial, exclusive winery and hotel founded by an American couple with various philanthropic interests in the area. Lee and Penny Anderson fell in love with the location and created something quite special here; combining their passion for wine with their appreciation of the finer things. I’d certainly describe this winery as the most opulent of my Croatian adventures. After a tour of the beautiful, modern facilities contained within the winery proper we descended into the cellar for a barrel sampling. 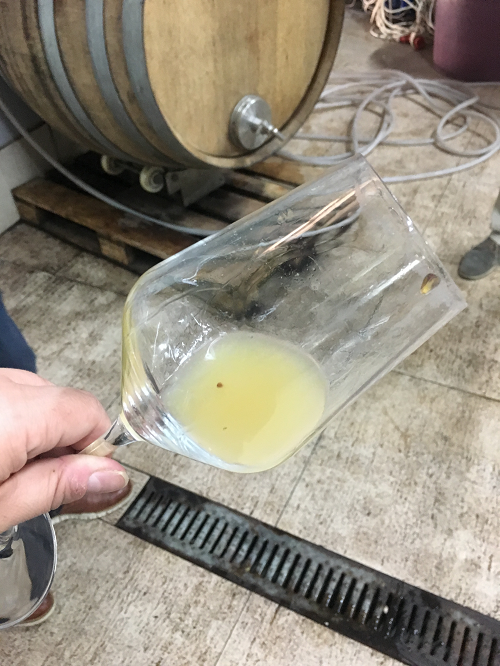 Ivo Cibilić, the general manager of Korta Katarina had us sample a young Pošip directly from the stainless steel tank it was fermenting in. We then went to visit the vineyards in Dingač, home of the Plavac Mali Appalation. It was the first official wine appellation in all of Croatia. The tunnel to Dingač. Better than riding a donkey! The only way to access Dingač by land was to drive straight through the mountain. 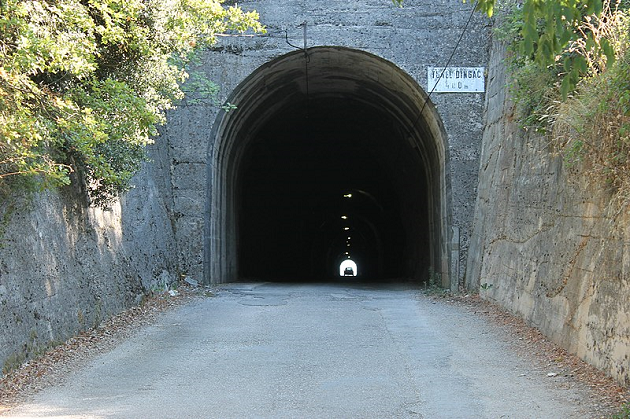 The Dingač tunnel was created in 1973 and paid for by the winemakers in order to transport grapes. The old method was to use donkeys and traverse a 400m high mountain pass. Over lunch and later dinner we had the opportunity to sample a variety of different wines. 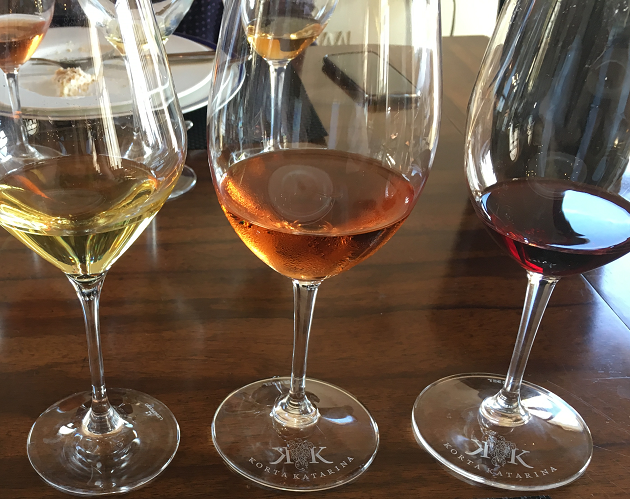 The highlights were the bright and mineral driven Pošip 2017, the creamy and strawberry infused Rosé 2017, and the dark and smoky Plavac Mali 2010. All three of these outstanding wines are available through the LCBO. 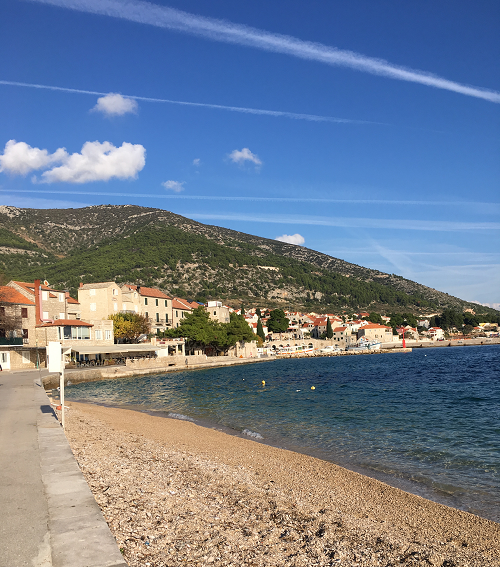 We left Korta Katarina and took a scenic drive to the village of Trstenik. This detour wasn’t solely about the journey however, we came to visit a small winery opened by something of a wine legend. It felt like Mike was here with us! 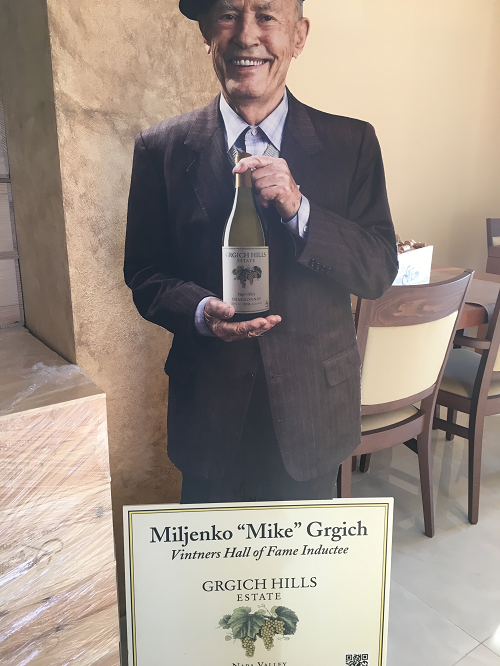 Miljenko “Mike” Grgich, is the founder of Grgich Hills Estate Winery in Napa Valley California. Mike was influential to the success of California wines and he is responsible for creating the winning Chardonnay at the judgement of Paris in 1976. 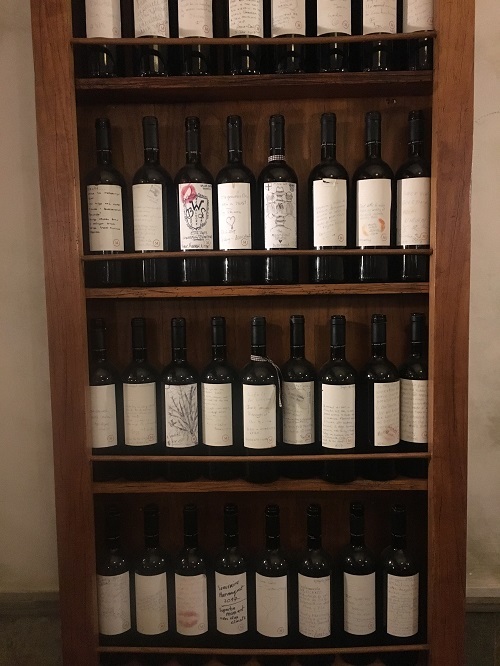 Another of Miljenko’s note-worthy endeavours was his involvement with the Zinfandel Advocates and Producers(ZAP) who were pivotal in steering research into the origins of Zinfandel towards Croatia. In 1996 Mike decided to open a second winery with the help of his daughter and nephew in his homeland called Grgić Winery. 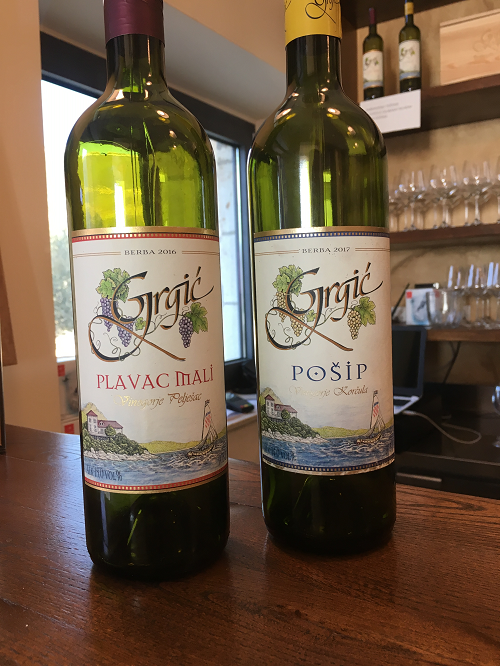 I had the occasion to sample both of their wines: Plavac Mali 2016 and Pošip 2017. 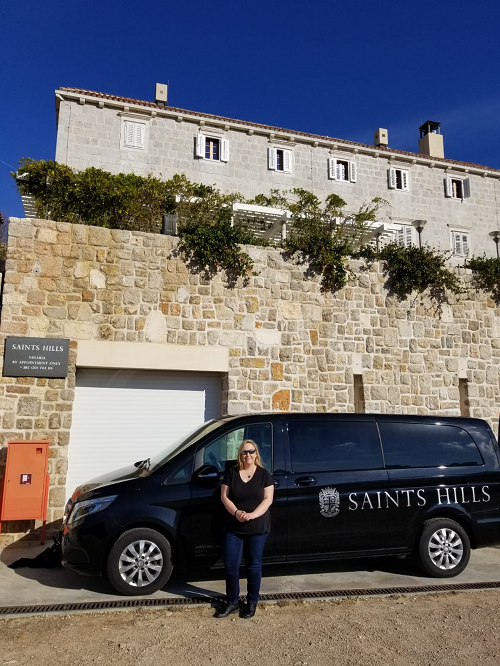 Our next stop was Saints Hills Winery, a young and dynamic winery further east on the Pelješac Peninsula in Oskorušno. Their vineyards are named after Catholic saints: St. Lucia, St. Ante and St. Roko as are their children. It was apparent that family plays a very important part in the process of wine making at Saints Hills Winery. The facilities and equipment were modern and clean yet contrasted by an old-world sensibility. Stainless steel, glass, mortar and stone. They have vineyards located in Istria and Dingač. 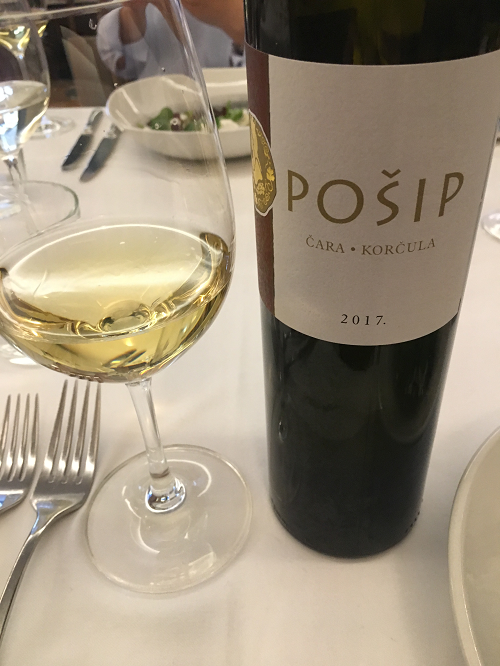 Their wines predominantly feature Malvasia Istarska, from their Istrian vineyards and Plavac Mali from their Dingač vineyards but there is some playful inclusion of French grapes such as Sauvignon Blanc and Chardonnay as well. 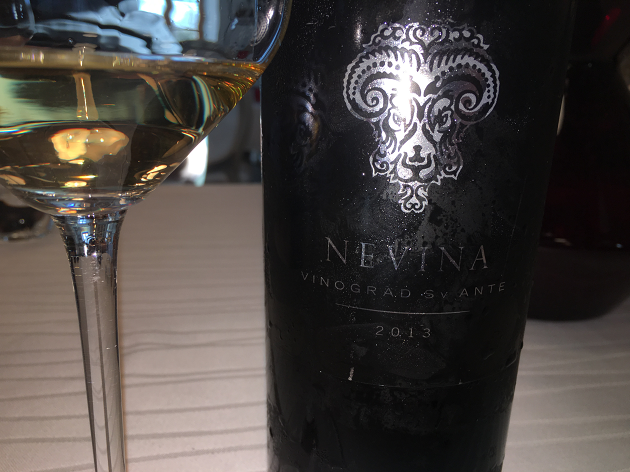 We tried the Nevina Sv Ante 2013 from vineyard St. Ante. A white wine composed of about 70% Malvasia Istarska and 30% Chardonnay. A premium wine with a complex bouquet consisting of stone fruit, vanilla and white flower aromas that carry into the mouth with resinous flavours of cooked pear with a long finish. 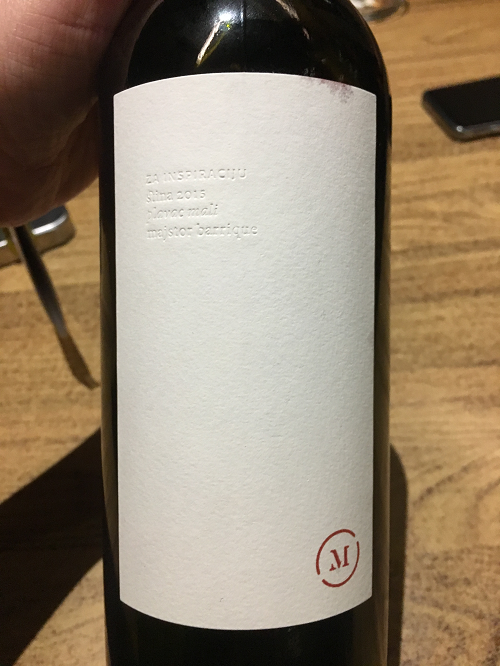 Next was a bold red wine, Sv Roko 2016 from the vineyard of the same name. It is 100% Plavac Mali and was aged in 50% new and used oak for 18 months. It possessed vibrant notes of blackberry, plum, smokey charcoal and a blend of fresh thyme and dried herbs. Two thousand sixteen was a exceptional growing and harvest year in this area and that fact came through in the quality of the wine. Although we were not given the opportunity to sample the Ernest Tolj, I felt obliged to give it an honourable mention. 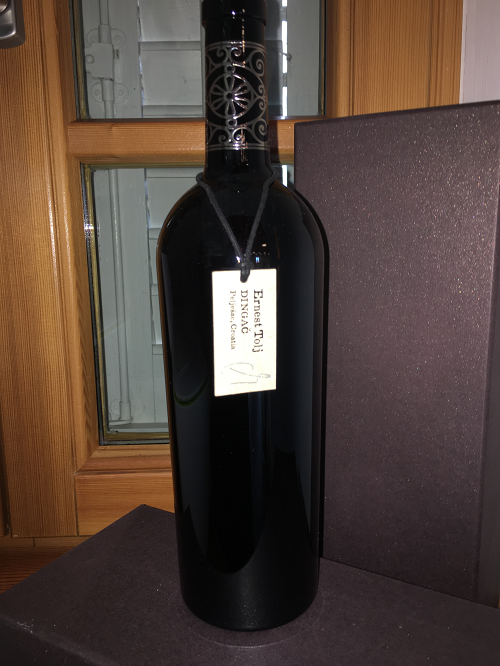 Each bottle of this Plavac Mali from Dingač is sold at a premium price but it’s for a truly altruistic cause, all proceeds of wine sales go towards supporting children who don’t have proper parental care. On our way to the city of Dubrovnik, which was the last stop in our Croatian tour, we visited Crvik Winery. Unlike the last few we visited, Crvik Winery had some real history behind it, having commenced production in 1897. Truly a small, family enterprise, the winery is figure-headed by the father and son team of Andro and Petar Crvik. 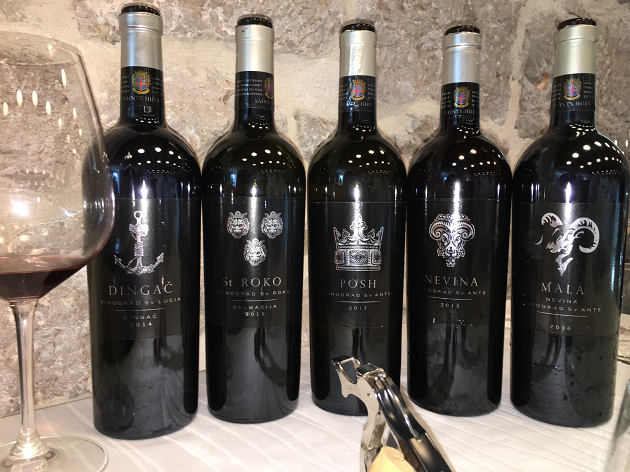 At their vineyards they grow native Malvasija Dubrovačka, Maraština and Plavac Mali as well as Merlot and Cabernet Sauvignon. 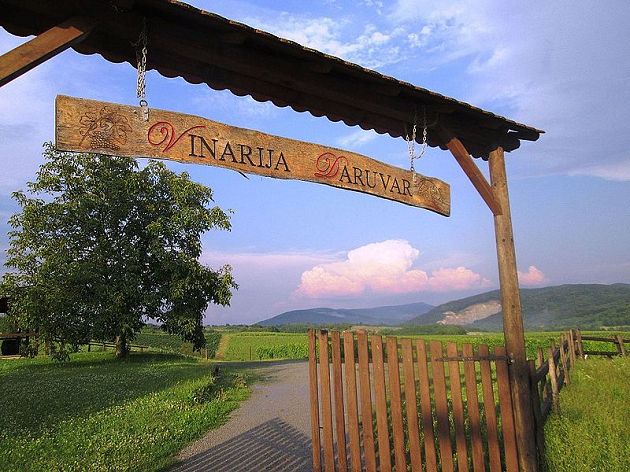 The Malvasija Dubrovačka is a local varietal that has been revitalized by Crvik winery. 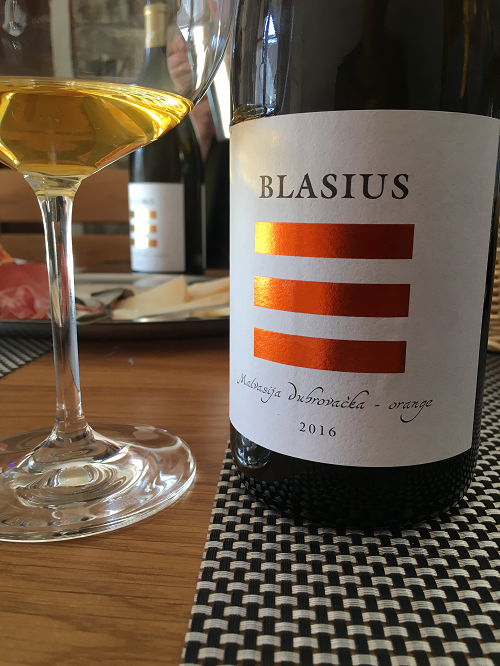 It is made as a white wine, the Tezoro Malvasija Dubrovačka and is also uniquely expressed as an orange wine, Blasius Malvasija Dubrovačka Orange. It macerates on lees for upwards of six months and ferments using natural yeasts with minimal disruption. The result is an extremely palatable and exciting orange wine. Pale amber coloured with elements of steeped peach tea, saffron, orange peel, marigold flowers and sandy earth. It is currently only produced in small batches which makes it rare and highly desirable. It is crafted with skill and innovation, this wine alone is reason enough to visit Crvik Winery. 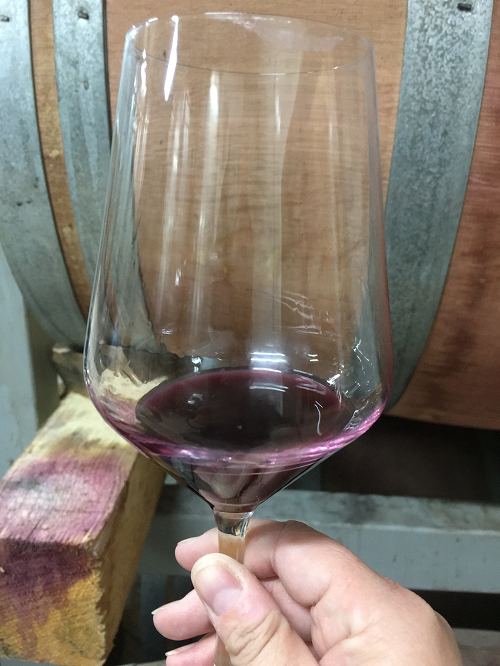 Another notable wine from Crvik Winery was the Negromant Merlot 2016. Made from a small parcel of their vineyards and true to the terroir. Dark plums, ripe blackberries and cherries are presented alongside fresh earthy tobacco leaves and hints of granite. Another impressive wine from Crvik Winery. 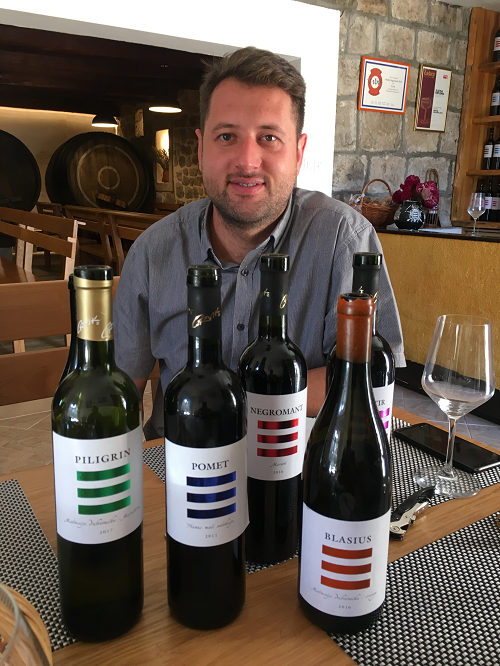 Oenologist Petar Crvik is clearly influenced by global trends in vinification while always looking for innovative and playful ways to express the craft he has worked so hard in cultivating. 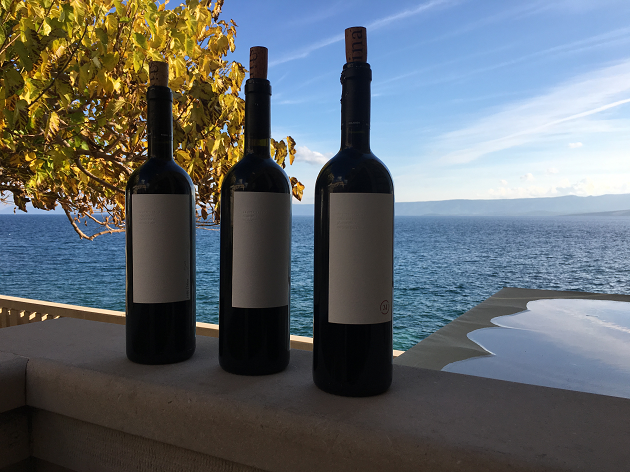 Crvik Winery was a great example of the exciting potential hiding within the borders of Croatia, waiting to be discovered in our glasses. 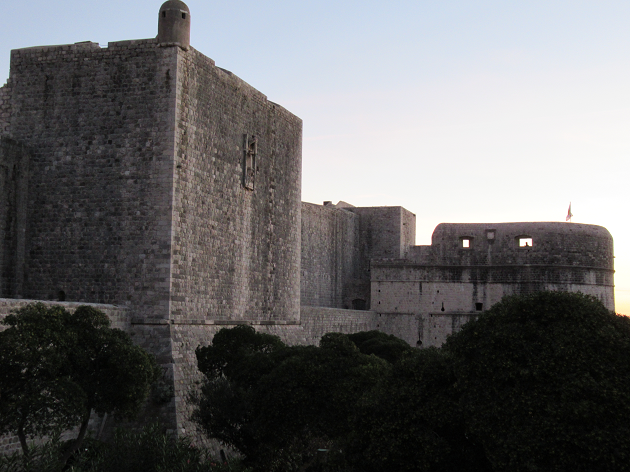 As my Croatian adventure drew to a close I found myself in the city of Dubrovnik, within the fortified walls of Old Town. The “Pearl of the Adriatic” as it is known was declared a UNESCO world heritage site in 1979 and is Croatia’s leading tourist destination. It retains much of its historic beauty in spite of earthquakes and armed conflict. I was thrilled by the prospect of visiting “King’s Landing” in person and was constantly on the lookout for dragons, my excitement however, was not fully shared by the locals. The Star Wars enthusiast in me, also spotted a few areas where the movie The Last Jedi was filmed. 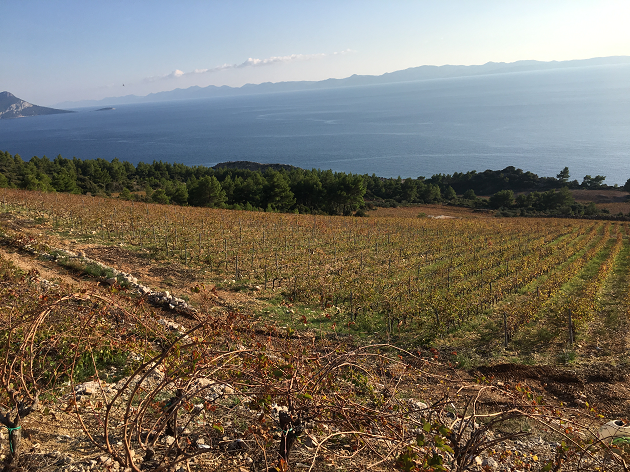 Croatia is certainly an exciting destination for wine lovers, with deep cultural roots and energetic entrepreneurs willing to take risks in the quest to making great wines. The people of this country, like it’s vines, are resilient. They have given so much of themselves and survived so much adversity. They have witnessed the rise and fall of empires. They have created incredible things in impossible places. They have never let go of their dreams or quit trying to improve. 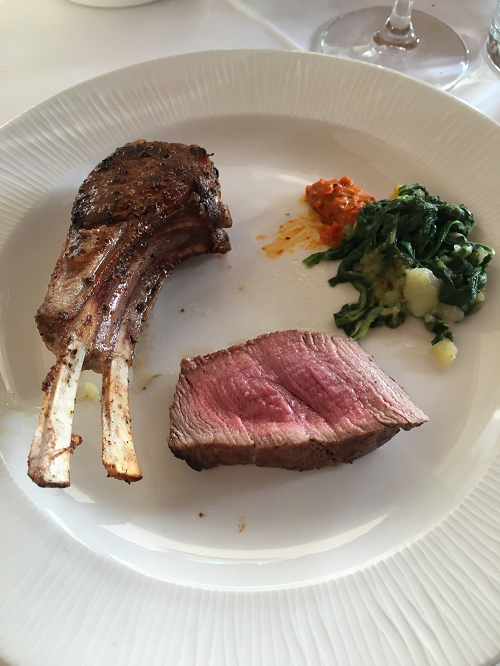 My final taste of Croatian food and wine would take place at Wine Bar Razonoda at The Pucić Palace. Within the bar I encountered a monument of artwork drawn by visitors on the unique white labelled Stina bottles from earlier in our story. It caused me to reflect once more on those words spoken to me, wine truly was an experience wasn’t it? The journey from soil to taste takes many different paths I would learn. It was a journey that involved hardship and joy, love and family, it broke through mountains and crossed oceans and it would eventually come to rest on a table, reflecting shards of sunlight from an open window. 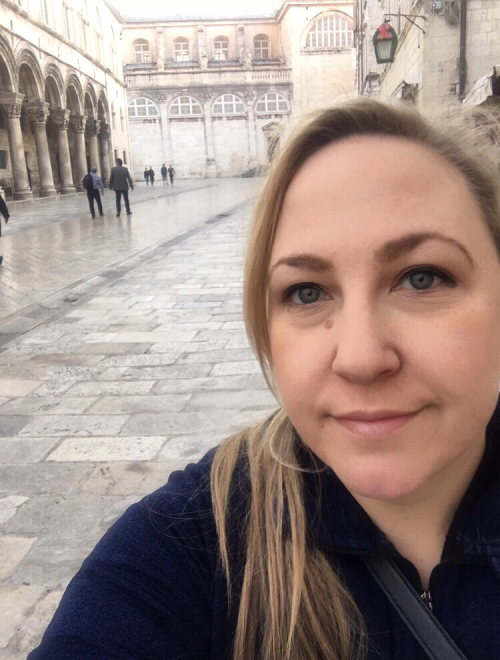 I was greatly affected by my experiences in Croatia. Whenever I open a bottle of Graševina, Pošip or Plavac Mali, I will recall a person or place that moved me. The wine is as much the terroir and the sunlight as it is the people who nurtured and harvested the fruit. Every glass tells a story. Andrea is a wine geek and a certified sommelier from Ottawa. 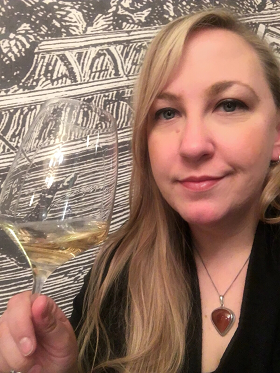 She is a member of the National Capital Sommelier Guild, the Canadian Association of Professional Sommeliers and has studied with the Wine and Spirit Education Trust. 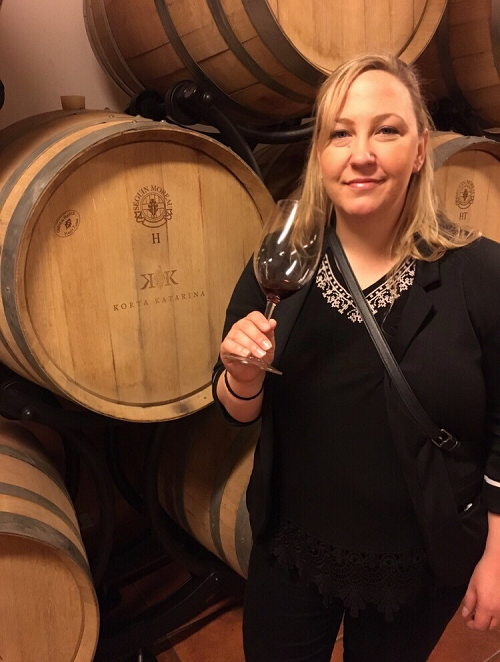 She is continually pursuing education to stay current in the evolving world of wine. Andrea has made the acquaintance of winemakers and viticulturists from all over the world and is always eager to learn more about the details of their craft as only they can relate. 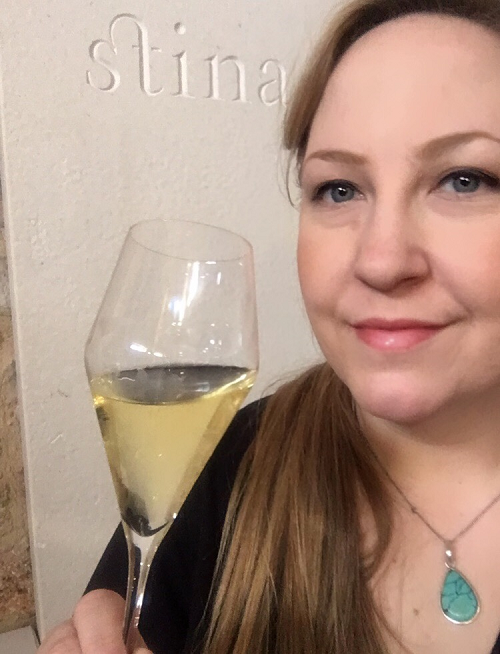 She is a regular attendee of wine shows and tasting events across North America but rarely turns down the opportunity to visit a far-off location in pursuit of uncommon grape varieties, new wines or regions to share with her friends and followers. 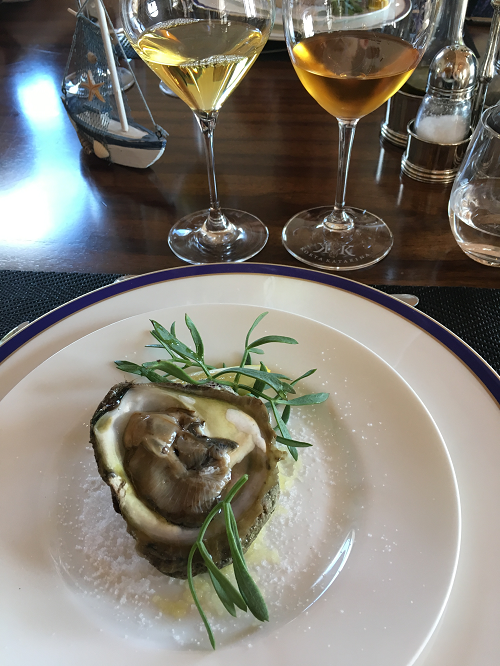 Andrea is extremely passionate about the synergies that exist between food and wine and is steadily seeking to learn more about potential pairings. A special meal with the right glass of wine is always an adventure. She can’t wait to tell you about the next one.